What does it take to be one of the best swimmers in the world? 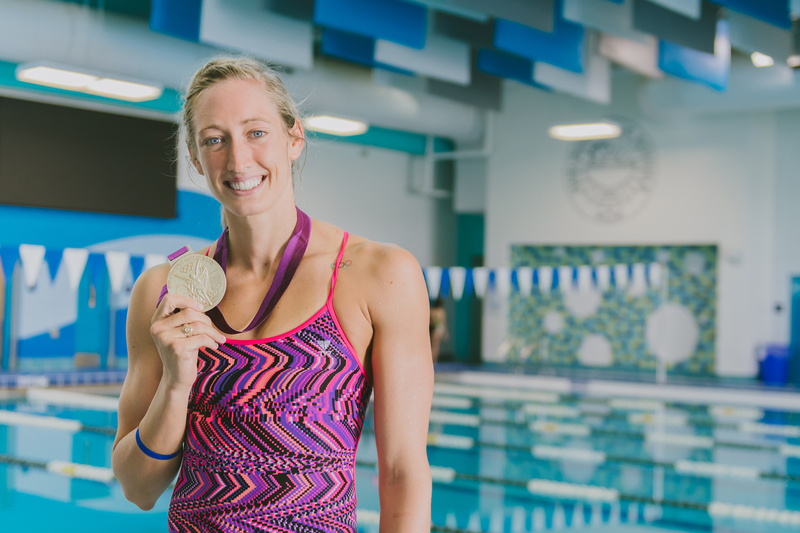 Discipline, hard work, and determination are what got Breeja Larson a coveted spot on United States Olympic Team and subsequently a gold medal in the 4×100-meter medley relay at the 2012 Summer Olympics in London. As Larson spoke to Harlingen High School and Harlingen High School South swim teams at the Aquatic Center on Thursday, August 24, she recounted the time that she felt like giving up. She had just joined the Texas A&M University Women’s Swim Team, and unlike many of her teammates at the collegiate level, she had only been swimming competitively since her senior year of high school. This powerful statement sent ripples through Larson. Larson told students about her journey and all the sacrifices she had to make to achieve Olympic gold. She expressed to them that no matter what they set their minds to, it takes hard work to become successful. As she reflected on her parents, the swim moms, and coaches that have helped her along the way, she said she hopes to inspire swimmers as others have inspired her. Larson spent the day holding clinics for students at the Aquatic Center and speaking to various groups of student athletes at HCISD.